All of these tips are offered from experience, either learning the hard way what not to do, or following the tips of close friends, family, and readers. PART I: Today I begin with my tips for traveling with your bike. Reality in 2015 is the cost of flying with a bike can add greatly to your overall ticket cost. You should expect added costs from $50 to $300 one-way. Please research bike luggage costs before deciding on a flight that is $75 cheaper than a competing airline, only to find out your bike is $150 more, each way. (Learned through Twitter rants). Start by discovering the airlines that fly to your destination. On their website, read the fine print about luggage allowance for bikes, including weight, loss or damage. Next look at transportation required from the airport to your hotel, tour group or starting city. Make sure all the pieces of the puzzle work, considering day, timing and limitations, and THEN look for the best airfare (calculating in all the extra expected costs). Bike shipping cost, weight and size allowances, loss and damage for each airline. Research all other transportation costs and choices: taxi, shuttle, van, train, bus, airport transfer. Purchase your airfare after you thoroughly understand Step 1 and 2. If you are searching online for information, make sure you check the date: you want 2015 information. United Airlines had a change in cost as recently as February 2015. Absolutely before purchasing your airfare read the airlines website in detail. Try your hardest to use one airline when completing your entire reservation. If you experience problems with connections or lost luggage - you will be dealing with one airline's customer service and baggage claim. Make your reservations directly through that one airline, you will receive better customer service for delays or cancellations than dealing with a second-party ticket agency. If using miles, call a customer service representative directly to see if she/he can get you a flight to your desired destination using your flight miles. They might find a route you may not have considered on your own or see flights available through their system, which you could not see online. (Learned happily by me). Consider using smaller airports, large airports often mean big taxes and fees, and more time navigating through long terminals with overworked employees. I will do anything to avoid Charles de Gaul airport with a bike box. From The USA to France, for example, Lyon, Marseille, Toulouse, and Bordeaux are much easier airports. For those within Europe, you might choose Biarritz, Pau, Lourdes, Grenoble, Nice or many others. Collecting and returning a rental car is also easier from these smaller airports (Learned from local friends). The same holds true for flying within the USA. I would select arriving into Burbank (BUR) or Santa Ana/John Wayne Airport (SNA) over Los Angeles International Airport (LAX). Allow extra time for transfers to another plane or train. Bike cases arrive in the over-sized baggage area and sometimes take 30-45 minutes to show up; sometimes well after all the other passengers have collected their suitcases off the belt and are busy kissing sweethearts. You'll be breaking out in a cold sweat, certain your bike has been lost forever, but be patient: allow enough time for your connection and believe that door will open and your bike will appear ready for its next adventure. I always plan to remain near my final arrival point on the first day, just in case my bike was lost or damaged in transit (Learned the hard way!). Typically the airline is able to find your bike and have it at the same airport for you within 24-hours. But if you eagerly booked a departing TGV for a destination 4-6 hours away immediately upon your arrival to meet a tour that starts at 8:00am the next day, things just got a lot more complicated. I learned to use the first day of arrival to buy supplies or perhaps visit a local bike shop, take a city tour and have a good meal, get some exercise - in the form of a long walk - and shake off jet-lag. You will bring three pieces of luggage with you, if one will be a bike. Two pieces if you have no bike. Carry-on luggage: inside this bag, keep a small lightweight strap bag or nap-sack that can be easily removed and kept at your seat during your flight. Inside this bag you should have everything you need during the flight. This bag should be capable of being quickly removed when you get to your seat, the rest of the heavier, bigger carry-on bag goes in the overhead compartment never to be revisited until you land. Inside your larger carry-on bag, should be your rental car papers, paper maps, any instructions needed upon arrival, and primary itinerary with reservation details. You should also carry on your camera, cycling shoes, any medications, laptop, GPS, battery charger for phone and all devices. I like to keep all my cords in one bag. I also carry-on my pedals in a pouch (but not a pedal wrench or tools) and I like to keep track of where my helmet has been, so I carry it as well. Remember to bring an electrical adapter if you will be changing planes in another country and have a long layover, this way you may charge your devices at the airport (although some airports now have for-a-fee charging stations). Do not pack any essentials in your check-in suitcase, if your bag is delayed for 24 to 72-hours, it can be a real inconvenience. Remember to remove air cartridges from your saddlebag before flying; instead bring a pump. I have seen passengers on the floor opening bike cases at the check-in counter to remove cartridges (of course one is always yelling at the other saying, "I thought you took it out"). Remember bike cases are opened at security, and can be unzipped. Don't pack anything of value in your bike case, or anything that could easily fall out of the case. Carry-on all devices and laptop, camera, or external hard drives. A stolen carry-on bag, that you swore you'd keep safe, can be a real bummer, so never ever put your wallet inside your carry on bag. Wear your carry-on over your shoulder at all times and avoid placing anything in external zippers. I keep a small amount of money easily accessible for small purchases, so I do not have to pull out my money belt/pouch in public. I keep a small pouch for euro coins. Always travel with two credit cards in case one is swallowed by a machine and gone forever (Happened to a reader at a tollway!). I leave a detailed itinerary at home with a family member, plus details of my credit card and airline pins, in case of an emergency (Learned by family and me). First things first, airlines will or will not accept liability for damage of bicycles, sometimes it depends on the type of encasement you use - you can find airline bike packing requirements in the fine print on their websites. The fee you pay is for shipping, it is most likely not for insurance (although your home or renters insurance might pay for damage to your bike). Your best chance for compensation from the airline in case of damage, is to exactly follow that airline rules for packing a bike AND inspect your bike immediately upon arrival and notify baggage claim in case of damage. I always bring a copy of my personal bike geometry and fit measurements. In case my bike is ruined - my vacation might not be. I can hope to rent a bike. What type of case should you use: hard case / plastic bag / cardboard box / soft case / wheel bag? For most people reading this blog (not including pros who have their luggage paid for), I am going to cut to the chase and recommend a soft-sided bike bag (unless such a case does not apply in the above paragraph). I realize I have posted in the past about how to pack hard bike cases (and I have one), but times have changed. There are excellent soft-sided bags that will protect your bike well. My brother has had great success with his Pica Packworks soft-sided bike case, or consider an Evoc Bike Travel Bag. Soft bags are easier to handle, easier to store inside a rental car and in a hotel or B&B room. The soft bags are lighter to carry and run a lower risk of your bike bag being overweight. I used to sweat my 14 pound bike being loaded into my 34 pound hard bike case. By the time all the packing and straps were added, I came in just under 50 pounds every time, with no room for anything else inside the case. I advise you to think of the security agents when you pack your bike case. Make their job easy and maybe they will show more care when closing your bag and maintaining its alignment inside your case. I label the bike case well on the outside and place a paper inside the bag with my name and address and intended destination and date. If you are using a hard case to transport your bike - bring a short strap with a large click buckle. Use this buckle strap to attach your rolling bike box to your rolling luggage, and instantly your weight load is far less having created a four wheel wagon of sorts. This is how I pull my luggage behind me through airports. Here is my final tip about bike boxes: be inconspicuous. Approach the counter with your act together, have your passport and ticket ready. Make it look like your case in easy to handle and lightweight. Don't offer information, but do answer all questions honestly. Smile, be kind, be patient, don't talk too much. You might just find that you won't be charged for your bike case. It has happened to me plenty of times, most often from Europe returning to the USA. Only once in the USA when the airline employee couldn't find the price on their own website, and the manager decided I was holding up the line (Their mistake, my gain). Oh wait, I do have one more tip: You might save money if you pay for your luggage (including your bike) in advance online. But if you do this, you loose the opportunity not to pay, but risk paying far more at the counter. Whichever way you choose, just don't start tweeting how outraged you are by high airline bike box costs - you should've done your research! My brother Mike gave up his old hard case for a Pica Packworks soft-side bike case. If you have any questions about packing your bike, make a trip to your local bike shop to arrange a time with a mechanic to teach you how to pack your bike and how to put it back together. I am sure you could ask to pay for a personal instruction session. It should take about 45-minutes to complete the entire packing process. Bring the phone numbers to the baggage claims departments at all airports you will be traveling to. Leave these numbers, along with your itinerary and bike case description with somebody back home. It can be easier to let them deal with local baggage departments then for you to worry about finding a lost bag in a different language in a different time zone (Learned the hard way!). Again do your research ahead of time, be prepared for things to go wrong; when they do not - your vacation is off to a great start. While in Italy, I find bus travel with a bike case to be easier than train travel: the curbside loading and unloading is much easier. Train stations in Italy often have a lot of stairs (Learned the hard way) and buses often depart from the center of towns. But be aware, not all buses will accept bikes, especially the transport buses between airports. If you are traveling anywhere on a bus with a bike, read the fine details on the bus company website before hand. Bike cases can be hard to load onto trains and also might result in a gruff conductor looking down his nose at your. The cases are sometimes stacked near the doors of the TGVs in France, and might have to be moved as passengers load and unload: requiring diligence and effort. Again read the luggage guide on the train websites prior to all travel. Most trains have both packaging guidelines and placement on the train guidelines that must be followed. Think car rental - plain and simple. Almost anywhere you will want to ride a bike in the United States will be reached by car, from a trail head or a town. Study car models to make sure your gear will fit. I have gone straight to the auto maker's website to look at the inside, or seat configuration, of a particular car model. In the USA, some car rental agencies rent racks or top luggage/gear containers. If the car rental agency does not rent a rack, you might find a local rack company (such as Yakima or Thule) that will rent you a rack and help you install it on the car (my brother does this for long road trips and finds it easier than storing one at home). You will want to Google rack rental [city name]. Once again, when you arrive into the United States, I would allow one day to make sure all your gear and supplies are in good condition and ready to go. Okay, it no longer means you will be placing your bike on a ship, but airfare and ground transportation across an ocean isn't all that much faster than a ship, and it costs a lot. A lot. There are more and more emerging businesses that offer to transport your bike for you in-country. This is especially convenient if you plan to attend an event or race and want to fly unencumbered. These companies offer services from packaging, loading, build and transport. See services listed on the particular event website or Google bike shipping, or transport, [city name or event]. More advances have been made in 2015: with more bike shops, lodges, and tour companies renting high-end bikes to customers. This is great news. Always check the bike frame and especially the gearing. If you will be climbing, you want at least a 28 rear cog and a compact crank, this is minimum gearing for women or for riders who plan to climb day after day. I am not shy - I'll take a 32! Saddles and stems might be adjustable for a better fit, just ask. To best fit a bike - I always bring a copy of my personal bike geometry and fit measurements (another tip is to bring a string marked with your key measurements). Bring your own pedals, shoes and helmet (and maybe even saddle). Reserve well in advance and ask about cancellation policies. For a safe back up, I would research two places for bike rental in any given area where you plan to ride, just in case something happens to your first reservation - your vacation is not ruined. Google the city with the words bike rental to begin your search. Also check the map for nearby cities that might rent bikes. Call a bike shop in your destination city and ask if they know who rents bikes in town. Once you find a bike rental shop, be sure they rent the bike you need for the type of riding you want to do. Traveling without a bike is much easier if you plan to pass through large cities. Using subways or taxis and walking distances over cobbles is much less of a hassle, not to mention elevators, stairs and already small enough hotel rooms. This is my 10 euro rental bike resting on the Koppenberg in Belgium. 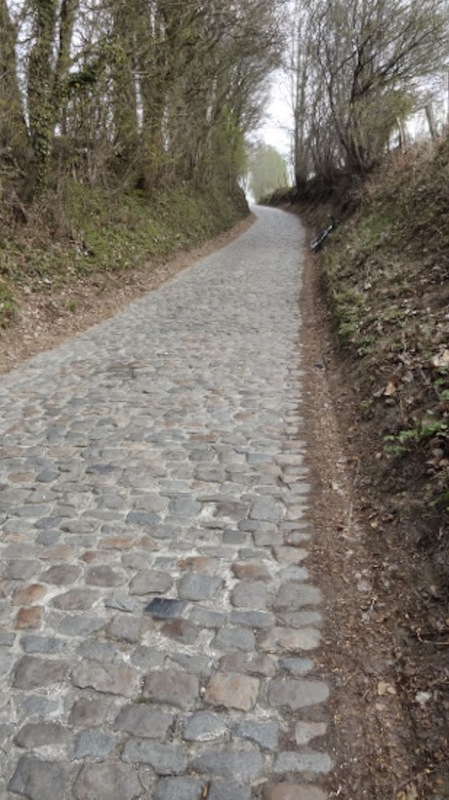 I rode this bike up the Kwaremont as well and had a blast! Rent anything if it means getting to ride a bike on vacation. I think this is a fine idea and chances are - the type of bike the company offers will be the bike best suited for the terrain you will be riding. Again bring your own shoes and helmet, and ask about saddle and frame size. After advice from a reader, I might suggest asking the Tour Company to send you a photo of the saddle you will be using during the tour. If you have any concerns, measure your saddle height, and pack your saddle and tools. (Learned from a reader who had a very painful, but fun, tour). I happen to know that renting a Renault Scenic will fit two hard bike cases upright in the back, allowing for luggage and two people. This car model will also hold three (uncased) bikes upright and 3 passengers. Bike cases definitely take up room in your car. Most cases will fit along the back seat of a car (without a passenger). Soft-sided cases are much easier to store than hard cases, and cardboard boxes can be disposable. I had a friend who asked a hotel to keep their two hard case bike boxes in a storage area while they traveled around France. They of course stayed a night upon arrival and another night before departure. Ask the hotel if they are able to store your box, you never know (Learned from a reader who is now a friend). If you plan to cycle tour from one location to a far distant location, then using a cardboard box (with plenty of plumbing tubing and bubble wrap and tape) is probably your best bet. Again, make sure your airline accepts cardboard boxes. Some people swear by using them. I met a trio of cyclists who arrived in France with their bikes in boxes, ditched the boxes, rented one car, bought a simple bike rack at a local sporting goods store, drove and rode select routes across the country, ditched the rack, found more boxes, returned the car, and flew home. 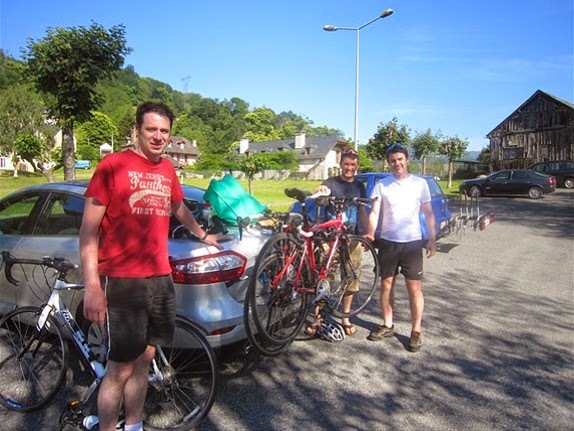 How the boys from Ireland made their way across the Pyrenees (packing up outside Pyrenees Cycling Lodge in June) with their bike rack and rental car. Unless you are going to a very secluded place (or are seven-feet tall like my nephew and looking for a bike frame), most cities have sporting good stores or bike shops where you will be able to buy anything you have forgotten or lost. A trip to a Decathlon store in France is a tradition. I always buy a couple lightweight blankets (dark gray preferred) to cover my bikes while in the car. Bring a lock, buy two light weight cheap blankets upon arrival. Although I do not ride my nice road bike to a place where I will need to lock it up and leave it, I have heard of bikes being stolen while resting along a cafe patio fence in a larger city (okay it was Grenoble, France and Boulder, Colorado). Even a lightweight lock will slow them down, or maybe they will take a different bike than yours. I do not leave my bike unattended in a large city. If I ride to a mountain top finish of a bike race, bikes are generally safe resting along the hillside. Be very careful leaving your bike inside the car. I always cover the bikes with blankets, and if I am in a big city, I lock them up (inside and out). I have learned to find a hotel near the airport for the night before any early morning departure. I arrive the night before and check into my hotel, depositing all my bags inside my room. I then drive my rental/lease car to the car return, leaving the car. I then use the free hotel shuttle service back to the hotel. I arrange the hotel shuttle to the airport for early the next morning, informing them that I will have a suitcase and a bike box. Now I have a sense of timing to get to the airport from the hotel the next morning. That evening I enjoy a glass of wine while repacking all of my bags and bike, leaving anything I no longer need for the maids and then get a good nights sleep. This is one of the rare instances I use big chain hotels during my travels, but I have learned it affords me with great peace of mind after a long trip. Try to find a friend to drive you to and from the airport. Airport Shuttle companies will charge you more to carry a bike, and taxis might not have room. Another good option is to arrange a local individual who owns a large SUV or van and transports people to and from the airport as a self-owned business. I personally have had great success with this type of service and find they often do not charge additional for bike cases. I am not talking Uber. I hope this post helps give you some ideas of things to think about and be aware of prior to your cycling vacation or event. Bon Voyage! Have a Great Trip! 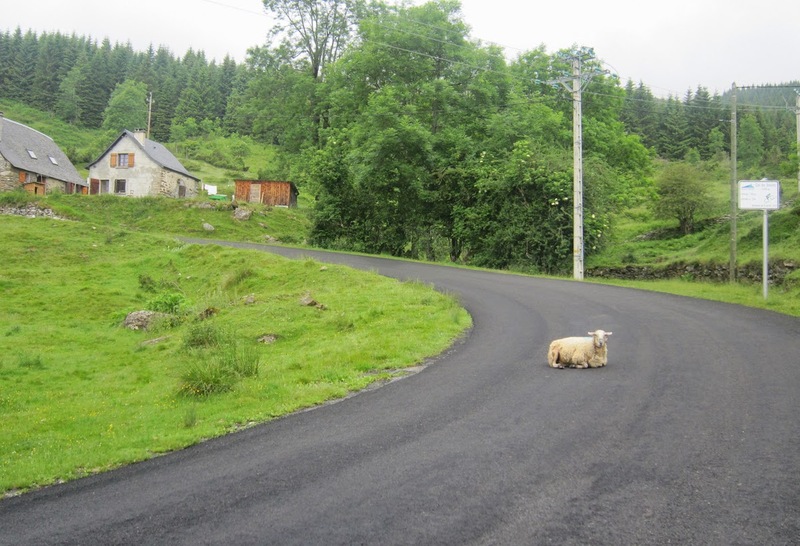 This photo has nothing to do with packing a bike, I just came across it while searching for bike box photos and it made me smile - a wonderful memory of cycling up the Col du Soulor in France on a lazy lamb kind of day. If anyone has any great bike travel tips - I will happily share them.